It’s estimated that a grand total of approximately $10,000 worth of equipment was stolen total. Councilman Kenyatta Johnson and Eagles President Don Smolenski present their checks to WYAA, which recently had $10,000 worth of football equipment stolen from it. Just days before the start of their season, the Wolves Youth Athletic Association’s youth football program was left without helmets, uniforms, shoulder pads and other equipment after it was stolen on Aug. 15. 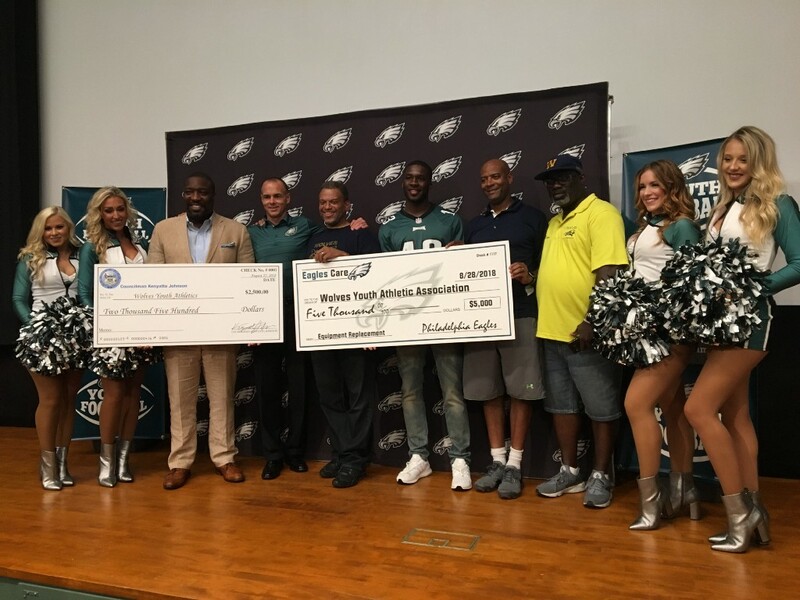 In an effort to support and unify the Southwest Philadelphia-based athletic association, Councilman Kenyatta Johnson (2nd District) and the Philadelphia Eagles came together to help contribute to the Wolves’ Equipment Replacement Fund. On Tuesday evening at the NovaCare Complex, the Eagles presented a $5,000 check to WYAA to put toward re-purchasing gear for the players. Additionally, Johnson’s office donated $2,500 toward the equipment replacement fund. It’s estimated that a total of approximately $10,000 worth of equipment was stolen. Tuesday’s check presentation is designed to help get the fundraising started for the WYAA. The Eagles and Johnson are putting an invitation out and encouraging the local community to help contribute to the Wolves’ Equipment Replacement Fund. Supporters can donate by visiting tinyurl.com/HelpWYAA.